I don’t know about you, but bronzer is for sure one of the most used/appreciated items in my makeup kit. Aside from being a great way to add that skin-kissed look without any damaging rays, it may single-handedly be my secret to surviving a dreary winter since you can still look like you just dropped in from the beach even when there’s a foot of snow outside. Whatever the season, you want to make sure your bronzer (and all your beauty products) are free of parabens and other nasty ingredients that can show up in your makeup, so here are our top picks for bronzers that will keep your skin happy from the inside as well as well as the outside! Jane Iredale: This pressed bronzer comes in several shades that you buy in refills and pop into a reuseable compact. Not only does it look beautiful with the striped design, but you’ll get a varied and rich pigment when you blend them all together as a bronzer, or you can use one of these to zero in on just one of the shades for a bit more contour or highlight where you want it. This also has a slight shimmer to it, so it’s a great option if you don’t want a completely matte look. Lily Lolo: If you like a matte pressed bronzer, this is a great option for even, buildable coverage. They use moisturizing argan and jojoba oil to keep the bronzer from feeling too dry and is fragrance-free, which is good for sensitive skin. The “Miami” shade is very light, so unless you are extremely fair-skinned or just want a small bit of color, I would suggest starting with the “Honolulu” shade otherwise. Kjaer Weis: This refillable compact system is a creme bronzer that comes in two shade options, has a little shimmer, and goes on smoothly. It has rosa rubiginosa oil, which minimizes scarring and aging and sweet almond oil to moisturize and promote skin elasticity. Best applied with the warmth of your fingers (do a swipe down the area you want to bronze and then blend with fingers in small circles) and then buff with a bronzer brush if needed. Han: With three shades to choose from (our Oui Fresh manager Keely loves the “Malibu” option), this bronzer is made from real cocoa powder and scented with cocoa powder absolute instead of an artificial cocoa scent that a lot of brands use. Yum! It goes on soft, leaves you with an airbrushed glow, and at just $16 it won’t even begin to break the bank. 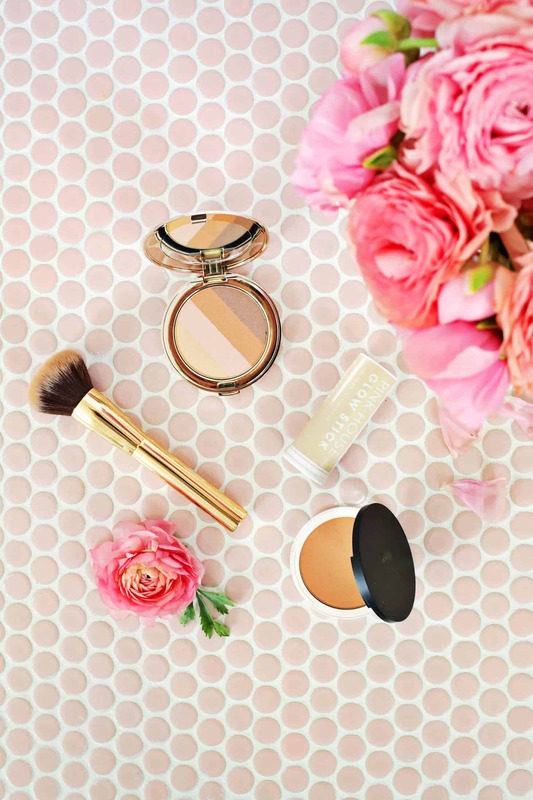 Physicians Formula: While not all of their items pass the clean beauty test (some of their bronzers have parabens), they do have some clean items and the added bonus is that it’s a brand you can find at Target, Walmart, and certain drugstores. So if you need something while out traveling (or just don’t want to/can’t wait for shipping), you can get to a clean bronzer quickly. 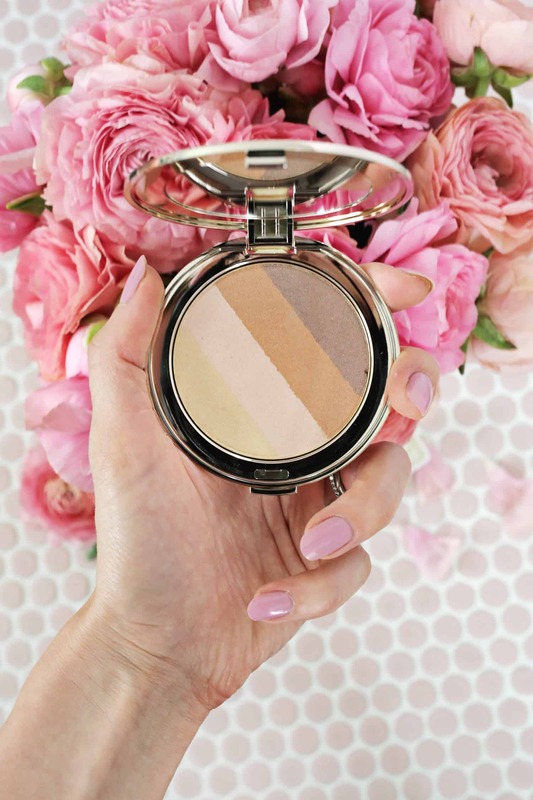 This bronzer is a great option from their brand and you can swipe across 2-3 of the shades that best fit your seasonal color and get a custom shade all year round! Rejuva Minerals: If you like a loose powder application, this bronzer/contour powder is blended with organic fruits and botanicals, is recommended by the EWG for having such a low score, is vegan, and in eco-friendly jars as well. It only comes in one shade though (although there is this lighter powder you can mix with to make a lighter custom shade), so you’ll have to be a little light or heavy-handed with it depending on your complexion, but I love it. 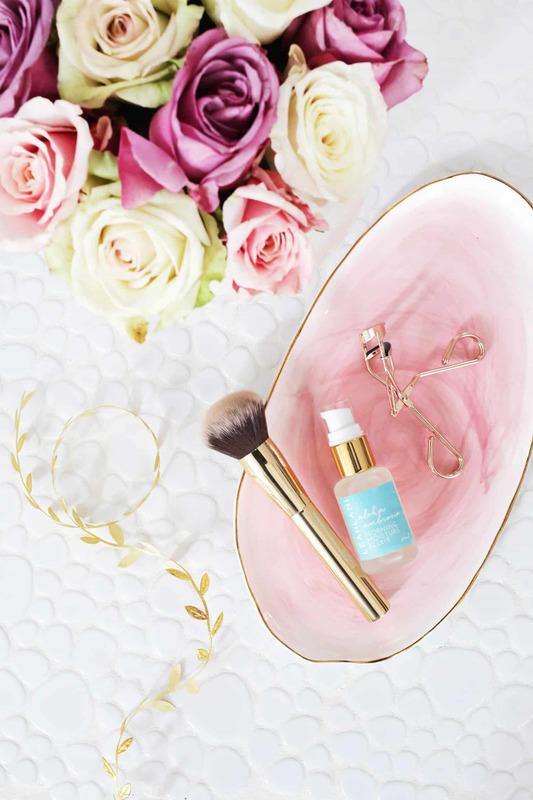 Pink House Organics: This bronzer highlight stick (in the “Champagne” color) will give you a shimmering style that looks like it came straight from the beach! Coconut oil, hemp oil, and shea butter help hydrate the skin and just a few swipes across the chin, down the nose bridge, and across the cheekbones will give you a heavenly glow. ILIA: For a more subtle highlight (with less shimmer than the Pink House option), try this stick in “Sway” for a bronzey glow. It has rose hip oil as a healing agent and you can also use it as a cream shadow on your lids and as a contouring stick. I love this color for a lighter highlight option as well! And what about a bronzer brush?? Good question! 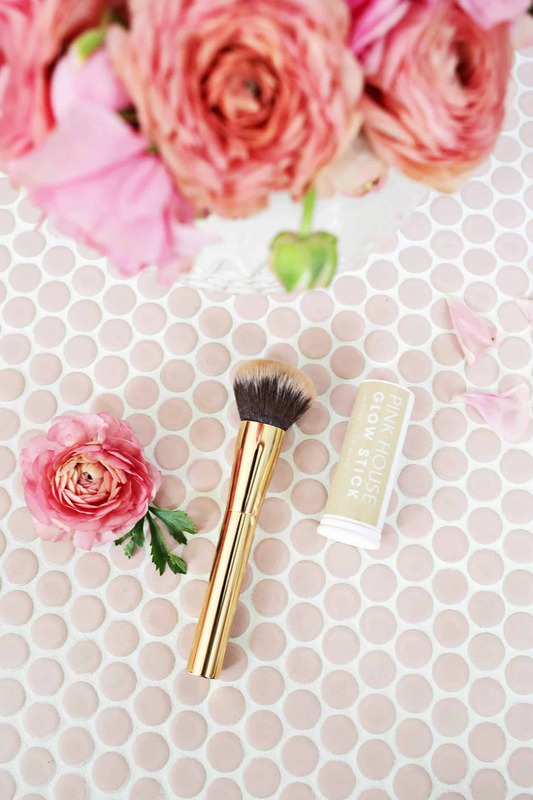 The pretty gold brush above is an amazing buffing brush (they have a smaller option for more precise contouring) or there is an amazing vegan kabuki brush as well. I love this round up! I hope you do more posts like this with other makeup and skincare products! It’s super helpful that it’s broken up into categories (Like budget, cream, pressed, etc.). I’ve been aiming to use clean products for years, but I’m still working on replacing some things. I’ve been specifically searching for moisturizers (that aren’t too expensive), makeup removers/facial cleansers, hair styling products, and mineral sunscreens, and it can be overwhelming trying to figure out what is truly clean and what will meet my needs and more specifically my budget. I refer to the ABM wish list a lot, but more roundups like this with several options within categories would be amazing! Good to hear, thanks Maggie! Thanks for doing the research on these and sharing! It saves the rest of us so much time to be able to search your posts when we need something new and clean! All great picks, especially to achieve that natural spring/summer glow! This saves so much time when looking for easy ways to switch over to more natural products. Keep the suggestions coming!!!! I’ve never actually used bronzer before, maybe I’ll try it this summer! YES! You should definitely get a new one… Glad you liked the mascara! These all look great, i’ve been on the hunt for a good natural bronzer! I’m not one to go for bronzers usually as I’m so pale I look better with blush, but some of the lighter ones may work! Thanks for sharing. I like a pressed powder bronzer from Chanel. It works great but it’s definitely not natural! Thanks for the explanation, I’ll try this weekend!